Nailsea has a rich history. Coal and Glass are well known as being a part of Nailsea’s history. Less well known though is Nailsea’s history of Cidermaking. 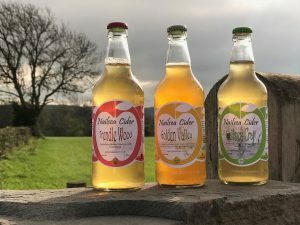 The famous Coate’s Cider was made in Nailsea, and before this nearly all the local farms made cider because they could pay their staff a proportion of their wages with the stuff. Good times! We’re a small scale production outfit. There are just a few of us working with a couple of orchards around Nailsea. We have an exemption to be able to make 7000 ltrs per year, but won’t get close to that for a while yet. We’re also using apples from trees in gardens around Nailsea. There are lots of trees around that are a hang-over from the orchards that used to be about Nailsea whose fruit otherwise just falls and rots. This gives us the ability to blend different varieties, but also to produce some cider made from the apples of just one garden – a personal cider. 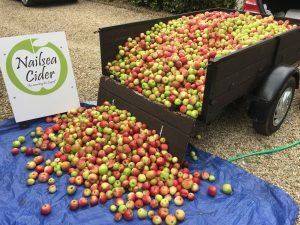 If you’ve donated apples, you can keep an eye on their progress into cider right here.